Interpret the ECG shown in Figure 1 — obtained from a 53-year old man who presented to the ED (Emergency Department) with new-onset chest pain of 1 hour duration. He was hemodynamically unstable with a systolic BP ~60 mm Hg at the time this ECG was obtained. What is the rhythm in Figure-1 likely to be? How certain are you of your answer? Clinically — What would you do? Figure 1: ECG obtained from a patient with new-onset chest pain. BP = 60 systolic. What is the rhythm? What would you do? NOTE — Enlarge by clicking on Figures — Right-Click to open in a separate window. Interpretation of Figure 1: There is a fairly (but not completely) regular WCT (Wide-Complex Tachycardia) at a rate of ~150/minute. 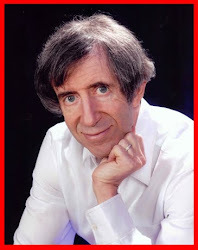 Normal P waves are not seen. The patient is hemodynamically unstable. Therefore — VT (Ventricular Tachycardia) should be assumed until proven otherwise. Immediate cardioversion is indicated. Do you agree? 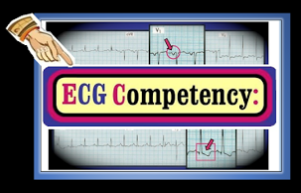 A number of questions are raised by this ECG and clinical scenario. How certain can we be that this rhythm is VT? Does it matter if we are not certain about the diagnosis — given that the patient is hemodynamically unstable? What specific features of this ECG and long lead II rhythm strip favor VT as the diagnosis? What features suggest this might not be VT? NOTE: This case was sent to me for my opinion. I did not see the patient. Before I reveal my sequential thought process — You might contemplate your answers to the above questions. MY ANSWERS: My initial assessment of the ECG in Figure 1 was as stated above — that the rhythm was a fairly regular WCT (Wide-Complex Tachycardia) at a rate of ~150/minute without normal P waves — therefore VT until proven otherwise. Since the patient was clearly hemodynamically unstable — 1st priority was to cardiovert the patient regardless of what the rhythm might be. This was done. That said — I was not certain of the diagnosis. While the QRS complex during the tachycardia seen in Figure 1 does appears to be wide — QRS morphology is not particularly suggestive of a ventricular etiology. Instead — it is more suggestive of an LBBB (Left Bundle Branch Block) pattern, in that a monophasic upright R wave is seen in both leads I and V6; and the QRS is predominantly negative in lead V1. The problem is that QRS morphology of LBBB-type during a WCT (Wide-Complex Tachycardia) rhythm is usually non-diagnostic — and, may be due to either VT or SVT (SupraVentricular Tachycardia) in which the reason for QRS widening is preexisting bundle branch block, aberrant conduction, or something else that produces baseline QRS widening. Several morphologic features IF seen are especially suggestive that a WCT rhythm is VT. 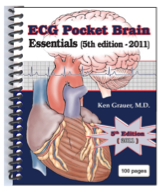 These include: i) Extreme axis deviation (ie, completely negative QRS in either lead I or lead aVF); ii) Completely upright R wave in lead aVR (without any q or Q at all in aVR); iii) Completely negative (or almost completely negative) QRS in lead V6; and/or iv) Global concordance of QRS complexes in the precordial leads (in which the QRS is either all positive or all negative in each of the 6 precordial leads). As helpful as seeing any of these features is in favoring VT — not seeing them is of no help in diagnosis. None of these features are present in Figure 1. The rhythm in Figure 1 is not completely regular. This is clearly evident on the long lead II rhythm strip. That said — VT is not always precisely regular. Given what looked to be regular R-R intervals between beats #2-3; 3-4; 6-7; 7-8; 10-11; 11-12; 16-17; 17-18; 20-21; 21-22 — I did not feel this rhythm was quite irregular enough to render a diagnosis of AFib (Atrial Fibrillation) — though this was in my differential given the absence of normal P waves. QRS morphology changes for beats #9, 13, 15, 19 and 23 in the long lead II rhythm strip of Figure 1. Are these capture beats or fusion beats that further support the likelihood that this rhythm is VT? I thought they might be. Having spent precious seconds contemplating the pros and cons reflected in the above bullets for “VT or no VT” — I was left with the following thoughts: i) I was not certain of the rhythm diagnosis; ii) Given uncertainty — VT should be presumed until proven otherwise; and iii) Given hemodynamic instability with high likelihood that this instability was caused by the tachycardia — immediate cardioversion was indicated regardless of what the rhythm turned out to be. The POST-Conversion Rhythm: As stated above — the patient whose rhythm was shown in Figure 1 was hemodynamically unstable. The patient was treated for VT — and, was shocked twice. This resulted in the rhythm shown in Figure 2. What is the post-conversion rhythm in Figure 2? Do you agree with the arrows that we have marked out in the long lead II rhythm strip? — in which red arrows were used for P waves we can see, and open arrows for the P waves we presume are present but hidden within the QRS complexes of beats #3,6,9 and 11? KEY Question: Does the ECG in Figure 2 change your opinion about what the rhythm was in Figure 1? Clinically — What do you think happened in this case? Figure-2: ECG obtained after the patient was shocked. What is the post-conversion rhythm? Does this ECG change your opinion about what the initial rhythm was in Figure 1? (See text). 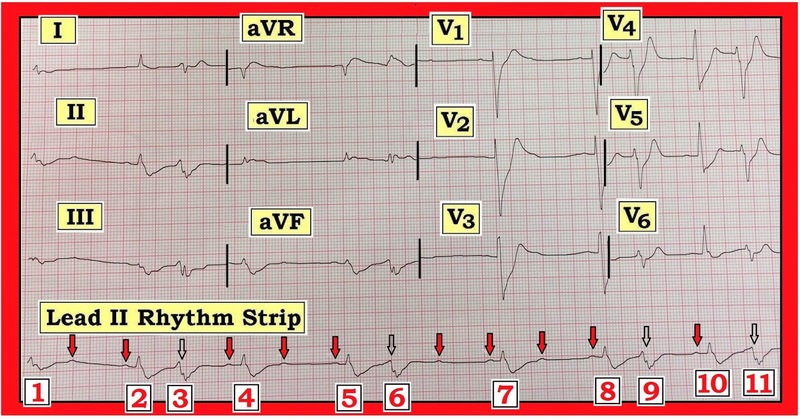 MY ANSWERS: Presumably — the arrows in the long lead II rhythm strip in Figure 2 do reflect conversion to a fairly regular sinus rhythm (with open arrows representing P waves hidden within the QRS complexes of beats #3,6,9 and 11). Some of these P waves are conducting — as evident from the constant PR interval preceeding beats #2,4,5,7,8 and 10. But many of the other P waves that should be conducting are not conducted. We therefore interpret the rhythm as high-grade 2nd Degree AV Block. Recognition that the P waves of beats #2,4,5,7,8 and 10 are conducted is KEY to retrospective determination of the rhythm in Figure 1. This is because we now know what the QRS should look like during a supraventricular rhythm. For example — Look directly above beat #7 in the lead II rhythm strip in Figure 2. 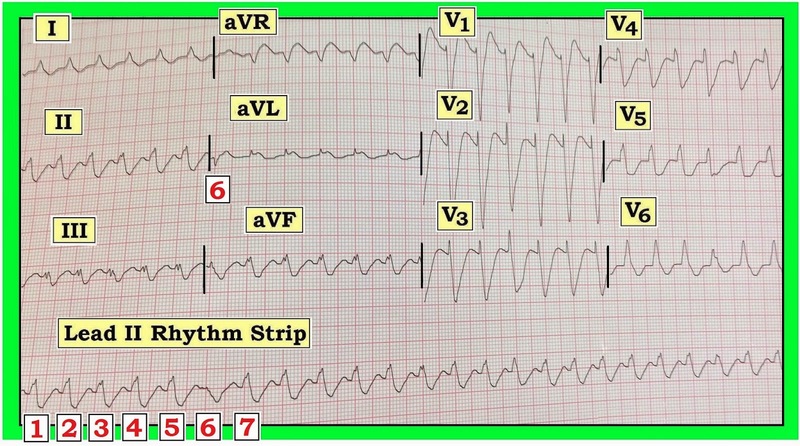 Note that the main reason the QRS complex in simultaneously-occurring leads V1,V2,V3 is wide — is due to dramatic ST segment depression that evolves into a peaked T wave. The same is true when we look directly above the sinus-conducted beat #10 — in that we see dramatic ST depression in leads V4,V5. Note that QRS morphology in the long lead II rhythm strip in Figure 2 is different for beats #1,3,6,9 and 11. That these beats truly look different than conducted beats #2,4,5,7,8 and 10 — is perhaps best seen by looking in leads V5 and V6 — where it is obvious that there are 2 differently shaped QRS complexes. Beats #1,3,6,9 and 11 are PVCs. 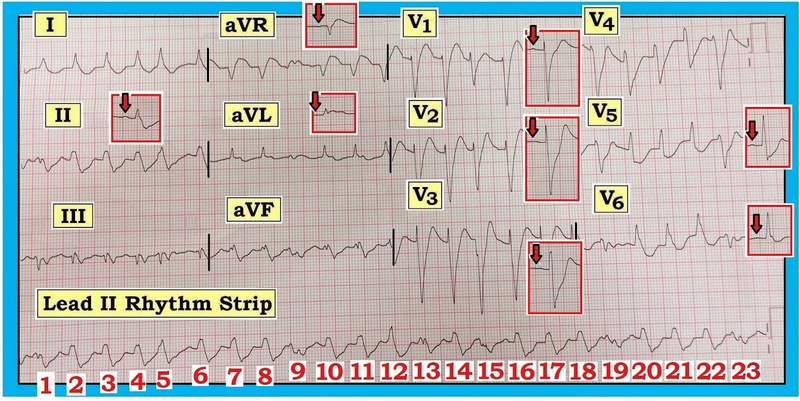 Knowing that beats #2,4,5,7,8 and 10 are conducted — allows us to assess these conducted beats in other leads on this post-conversion ECG for ST-T wave changes. Doing so reveals a picture highly suggestive of DeWinter T waves! That is — We see subtle-but-real ST elevation in leads aVR and aVL — and significant J-point ST depression in leads V1-thru-V5 that leads into peaked T waves (at least in leads V2,V3). In a patient with new-onset severe chest pain — this ECG pattern is highly suggestive of acute proximal LAD (Left Anterior Descending artery) occlusion. To check out the above theory — I made Figure 3 by superimposing on the ECG from Figure 1 (BLUE border) a series of inserts showing sinus-conducted complexes from leads II; aVR,aVL; V1,V2,V3; and V5,V6 in Figure 2 (RED borders). Apart from perhaps slight additional ST-T wave widening (attributable to tachycardia) — QRST morphology during the initial “wide tachycardia” in Figure 1 is very much like QRST morphology of sinus-conducted complexes in Figure 2. In retrospect — I think the rhythm in Figure 1 was supraventricular all along. The illusion of “QRS widening” was probably produced by marked ST-T wave abnormality from the DeWinter T wave pattern. An additional component of ST depression may have been added in Figure 1 attributable to the supraventricular tachycardia (which is a known cause of ST depression). Rather than fusion or capture beats — I suspect the underlying rhythm in Figure 1 may have been sinus tachycardia (with sinus P waves hidden within preceding T waves) — and, with beats #9, 13, 15, 19 and 23 being PVCs. 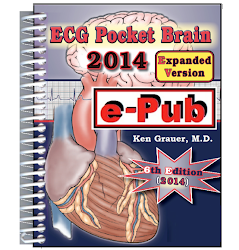 This premise is supported by Figure 2, which indeed shows PVCs of similar morphology to that of beats #9,13,15,19,23 in Figure 1. Figure-3: ECG I made by superimposing on the ECG from Figure 1 (blue border) a series of inserts showing sinus-conducted complexes from leads II; aVR,aVL; V1,V2,V3; and V5,V6 in Figure 2 (red borders). Note similarities in QRST morphology during after the tachycardia (See text). 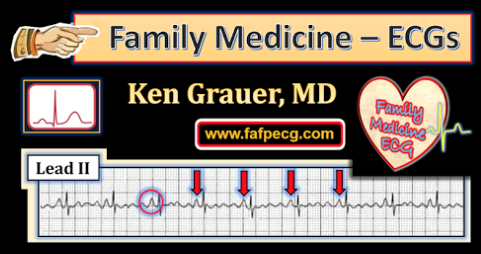 Putting It All Together: I suspect the reason for this patient’s new-onset chest pain was acute proximal LAD occlusion (DeWinter T wave pattern). 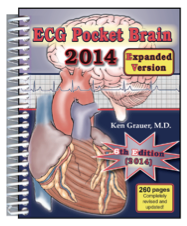 He was probably in sinus tachycardia in Figure 1 with cardiogenic shock from his evolving acute STEMI. In the “retrospectoscope” — one can question the initial cardioversion. That said — given the initial ECG picture and hemodynamically instability that for all-the-world seemed the result of the tachycardia — initial shock was indicated. This case is unusual and highly instructive because QRS widening seemed not to be due to preexisting bundle branch block or aberrant conduction — but rather to dramatic ST-T wave changes from a DeWinter T wave pattern. 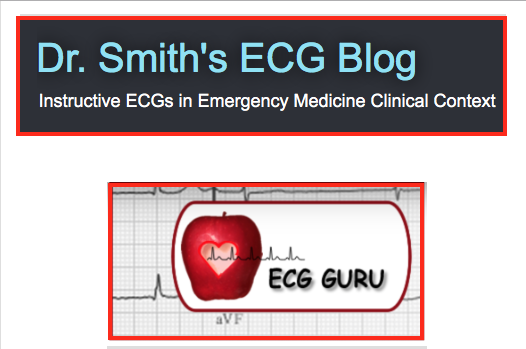 Case Conclusion: Following the ECG in Figure 2 — the patient developed progressive bradycardia followed by PEA arrest. He was resuscitated with Epinephrine and intensive CPR. 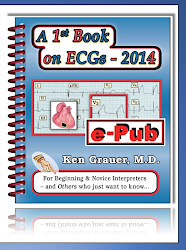 A pulse was temporarily regained, in association with the ECG shown in Figure 4. He remained hypotensive despite pressor therapy. He arrested again — and could not be resuscitated. In view of previous tracings — How would you interpret the ECG shown in Figure 4? The patient was not responsive and was hypotensive at the time this tracing was recorded. Figure-4: ECG obtained following resuscitation from PEA arrest. The patient was hypotensive. In view of previous tracings in this case — What is the rhythm? 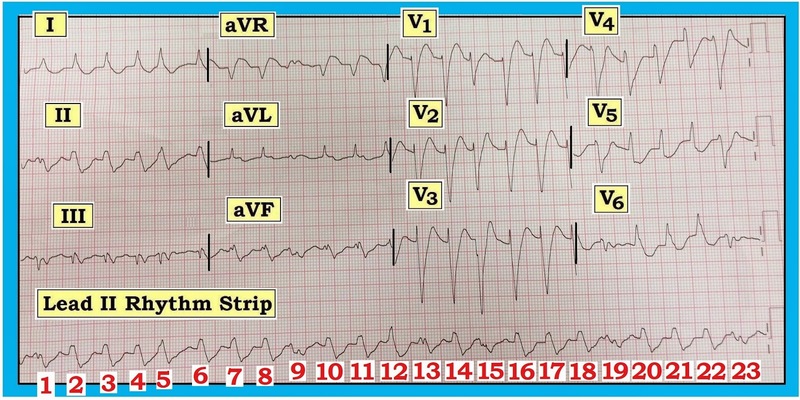 Interpretation of Figure 4: If simply shown the ECG in Figure 4 and told that this ECG was obtained during a code from a patient who remained hypotensive — VT would clearly be the presumed rhythm diagnosis. However — We feel a fairly convincing case has been made that the original rhythm in Figure 1 was supraventricular and not VT. Given close resemblance of QRST morphology between wide beats in Figure 1 and Figure 4 — We strongly suspect the rhythm in Figure 4 is again supraventricular (perhaps sinus tachycardia?) with QRS widening still due to the DeWinter pattern. Morphology of beat #6 in Figure 4 is consistent with morphology of other beats felt to be PVCs in Figures 1 and 2. Acknowledgment: I am greatful to “CZ” — who sent me these tracings and allowed me to use this case for teaching. 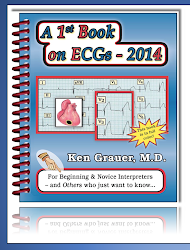 For review on DeWinter T Waves — Check out our ECG Blog #53.